Just came across this interesting piece that depicts the situation Nigeria is presently facing. Boko Haram commmander, Abubakar Shekau has demanded for a 2-day urgent meeting with the President, his Vice and the 36 Governors in the country. It will start on Sunday and end on Monday. The meeting is to hold in their Camp in the dreaded forest. Government reaction: President Goodluck Jonathan has directed that all the Governors should be present in the meeting as he wont be able to be there because he has an urgent meeting in Paris. Oga Jona escapes. Fashola said he should call another person because he himself is already on his way to England to see the Queen. but Uduaghan said I was about calling you to tell you that am on my way to UK Prison to see my Oga, Ibori. Okorocha said ehyaa, I just want to tell you that I am in One Airport in Ghana, and many of the Governors are also here with me, we are on a queue to get a ticket for night flight. Please we are all coming back to Nigeria on Tuesday evening. Ajimobi got to the Airport trying to jet out, he saw Aregbesola booking for a ticket to move with the next flight. 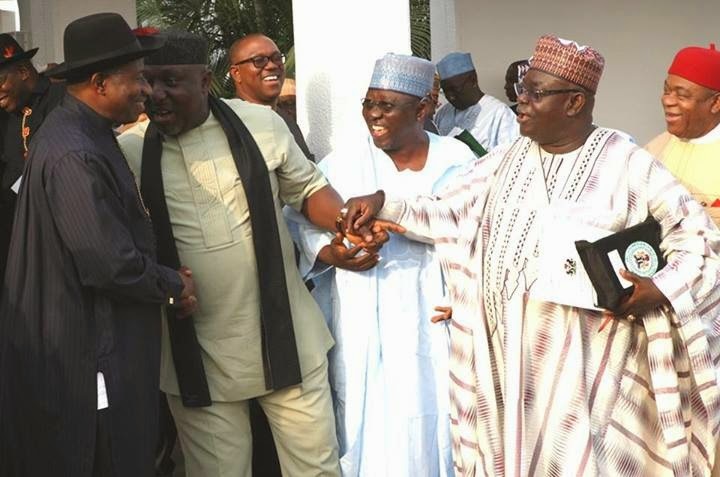 When Okorocha called the Vice president to ask how d meeting will be, Sambo said i am not feeling fine and i wont feel fine until tuesday evening……..Okorocha said ehyaa, i just want to tell you that I am in One Airport in Ghana, and the other 35 Governors are also here with us, we are on a queue to get a ticket for night flight…….we are all coming back on Tuesday evening. Fellow Nigerians: who will now attend to this Boko Haram and save Nigeria from this madness? Few days after US Marines were moved from Nigeria to Sicily, US General Mark Welsh hinted that the United States might limit its involvement in the ongoing search for the kidnapped school girls in Borno state because the Nigerian Military are very afraid of the dreaded extremists. Relations Committee, the US Air Force Chief of staff, Gen. US officials have also said that its involvement had also been made difficult because Nigerian officials ignored past warnings to soften brutal tactics that only fuelled the Boko Haram’s insurgency. At Thursday’s Senate Foreign Relations Committee hearing, officials condemned the kidnappings and committed American aid to help rescue the girls. But they also expressed frustration at Nigeria’s political and military leaders for failing to heed Washington’s warnings about the extremist group. “We have been urging Nigeria to reform its approach to Boko Haram,” Principal Deputy Assistant Secretary of State for African Affairs, Robert Jackson, said. He added, “From our own difficult experiences in Afghanistan and Iraq, we know that turning the tide of an insurgency requires more than force. The state must demonstrate to its citizens that it can protect them and offer them opportunity. A retired Head of the US military’s Africa Command, Gen.
search for the girls difficult. roughly the size of West Virginia, so it’s a tough challenge, to be sure,” state Department spokesman, Marie Harf, said on Thursday. grammatical blunder on national TV. Ali Baba said the First Lady lacks basic education and that is why her grammar is very poor. Patience Jonathan were educated, we will not have the problem that people think we have with her not being able to speak English”. obvious that Patience (Jonathan) did not get any of the above, or did not get it properly”. 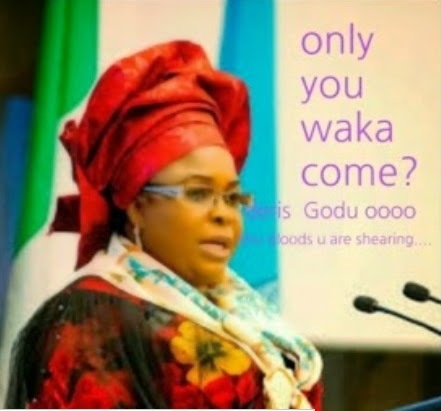 video of Patience Jonathan and Patrick Obahiagbon. Rio Ferdinand has announced that he will leave Manchester United this summer after a glittering 12-year career at Old Trafford. The 35-year-old defender joined United in 2002 from Leeds United and made 312 Barclays Premier League appearances, scoring seven goals, and winning six League titles in 2002/03, 2006/07, 2007/08, 2010/11 and 2012/13 He also won one UEFA Champions League medal, two League Cups and a Club World Cup.I have thought long and hard over the last few months about my future and, after 12 fantastic years playing for what I regard as the best club in the world, I have decided the time is right for me to move on,” Ferdinand said in a statement on the club website. Ferdinand, who also made 127 appearances for West Ham United in the Barclays Premier League between 1995 and 2000 and 54 for Leeds United over two seasons, made his final Man Utd appearance in Sunday’s season-ending 1-1 draw against Southampton.